Plymouth’s Arrow Pickup was introduced as a companion vehicle to the Plymouth Arrow car. This was in 1979. Like the Arrow car, the pickup was also based on a Mitsubishi product. Payload was an astonishing for the day in a compact truck @ 1557 lbs. Powering these through their model run were a 2.0L Mitsubishi I4 making 90hp, or a 2.6L Mitsubishi I4 making 105hp. Standard was a 4-speed manual. Optional transmissions were a 5-speed manual or 3-speed automatic. A performance trim level called Arrow Sport was sold from the get-go. It included graphics, standard 2.6L, standard 5-speed, high-back bucket seats, center console, and full gauges. Three unique colors were also your choice with this package. They were ‘Spitfire Orange’, yellow/black Two-Tone, or solid black. For 1980, the 5-speed gained an overdrive gear. In 1981, air conditioning, power steering and a rear sliding window were added to the option list. Another trim called Arrow Custom was sold starting this year. Basically it was a Sport with toned-downed colors. 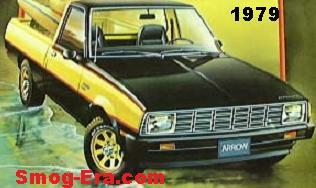 In its last year, 1982, another trim level called Arrow Royal was added. This package had many amenities as the Custom but also added a higher payload. The Arrow Truck was replaced by the Scamp in 1983.